In this age of Netflix and Red Box, aren't you glad that there's still a place in Tucson where you can find a VHS copy of Revenge of the Nerds IV at 2 in the morning? With those corporate brick-and-mortar rental chains at every other intersection becoming rapidly extinct, Casa Video has got just one location and one is all you're going to need. After munching on popcorn while you browse through thousands of titles (they even have video games and audiobooks), you might start to understand why people come from across town to find what can't be found elsewhere. Casa Video is the only place where the staff knows the difference between the similarly titled but oh- so-different Slacker and Slackers. 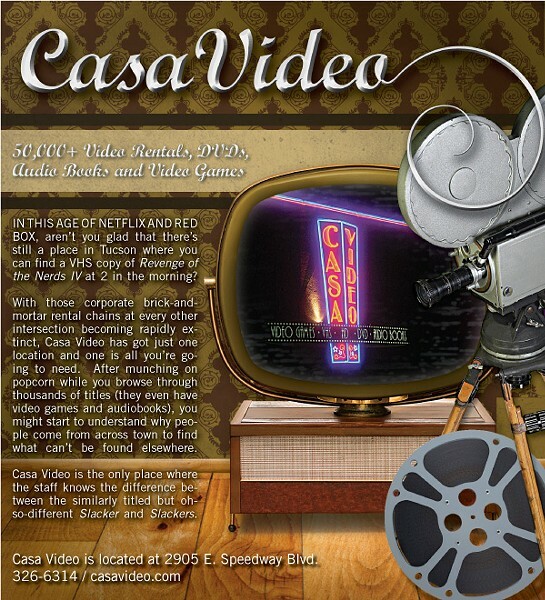 Casa Video is located at 2905 E. Speedway Blvd.